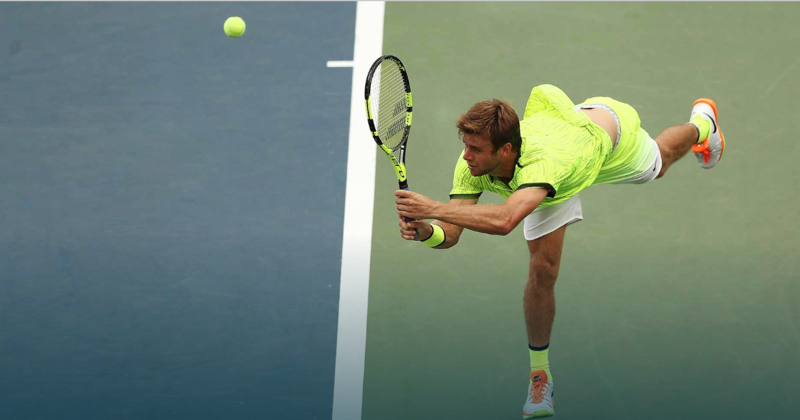 American qualifier Ryan Harrison claimed the biggest win of his career Wednesday when he upset fifth seed Milos Raonic 6-7(4), 7-5, 7-5, 6-1 at the US Open. Harrison played inspired tennis and took advantage of an ailing Raonic, who struggled with his cramps from midway through the second set. Harrison had a 1-26 record against Top 10 opponents before today, with his lone win coming over then World No. 10 Grigor Dimitrov in Acapulco in 2015. Despite levelling the match at one-set all after converting his seventh set point, Harrison looked a long way from victory when Raonic broke him in the first game of the third set. But the Canadian was increasingly hampered by cramps in his his arms and legs and handed back the break in the eighth game, when he served three double faults. Soon after Raonic served two more double faults and missed an overhead to drop serve and hand Harrison the set. Asked what led to the cramping, Raonic said, “A little bit of stress. I don’t think hydration was an issue. I think I always take that precaution. Probably just nerves and stress, a mental sort of overexuberance. In the fourth set, this year’s Wimbledon finalist began to labour even more with his court movement, with Harrison remaining strong in warm conditions to claim the victory. Harrison said, “Once I realised it was just the cramping, and you see a guy who’s kind of labouring out there, it becomes tough initially, especially because when I first started to pick up on it, it was still him up a break in the third. “… All I was thinking once I got to the third set was I really want to make this feel like a long way back for him. If he’s not already feeling physically good, I want it to be a long way back. It was a poor serving day for the Raonic, who threw in 15 double faults, and won just 67 per cent of the first serves he put into play. He also paid the price for converting just three of 19 break point chances. He also made nearly twice as many unforced errors (62 to 33) than Harrison as he delivered a high-risk groundstroke bombardment, crushing flat forehands and backhands with little margin for error. But take no credit away from Harrison, who took the fight to Raonic with 23 forehand winners and 10 backhand winners, including a number of key backhand passes when Raonic was at net. He also handled the warm conditions better and looked fresh despite the first three sets lasting 3 hrs., 11 mins. Harrison next meets former Australian Open finalist Marcos Baghdatis, a 6-2, 6-4, 3-6, 6-4 winner over Frenchman Benoit Paire. Harrison says he is happy where his game and mind are at. “It’s mental maturity, a little bit of stabilisation with everything around me that is allowing me to play with a sense of calm and also with excitement. My personality is a very fiery one. I like to be really intense when I’m competing. Flirt with that line of getting so intense that it’s taking me away from what I was trying to accomplish out there. Harrison is No. 120 in the Emirates ATP Rankings and, like younger brother Christian, had to win through qualifying to reach the main draw. This is his seventh consecutive appearance in the main draw and the first time that he has reached the third round in any Grand Slam tournament. He had won just seven tour-level matches coming into the US Open but had shown form during the hard-court swing. As a qualifier at both events, he reached the round of 16 in Washington and at the ATP World Tour Masters 1000 event in Toronto, where he pushed Top 10 Czech Tomas Berdych to 6-4 in the third. Formerly World No. 43 in July 2012, Harrison was last ranked in the Top 100 in January 2014.